Color: Blue -Description: Blue five pocked short with belt loops, adjustable waistband thanks to inside elastic with buttons, and closure with buttons and zip, on the front. It is embellished iconic metallic D on the back. 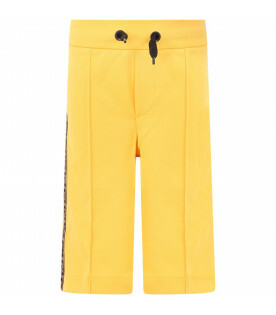 -Details: 92% Cotton 8% Elastan. Machine wash at 30°C. Color: Blue -Description: Blue short with four pockets, belt loops, adjustable waistband thanks to inside elastic with buttons and closure with button and zip, on the front. 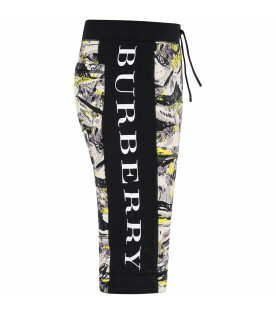 It is embellished with colorful all-over tiger, radio and logos. - Details: 100% Cotton. Machine wash at 30°C. Color: Black -Description: Black short with belt loops, three frontal pockets, one pocket on the back, adjustable waistband thanks to inside elastics with buttons and closure with press-stud and zip, on the front. 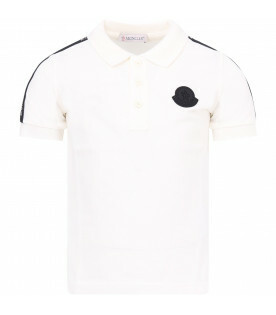 It is embellished with grey embroidered logo, on the front. -Details: 95% Nylon 5% Elastan. Machine wash at 30°C. 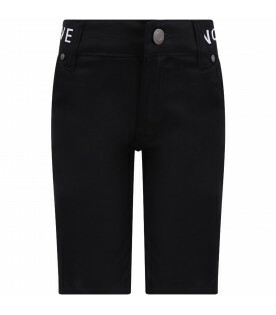 Color: Black -Description: Black short with elasticized waistband and side pockets, on the front; made from cotton. It is embellished with white rubbred thunders, on the front. -Details: 100% Cotton. Machine wash at 30°C. Color: Blue -Description: Blue short with four pockets, belt loops, adjustable waistband thanks to inside elastic with buttons and closure with button and zip, on the front. 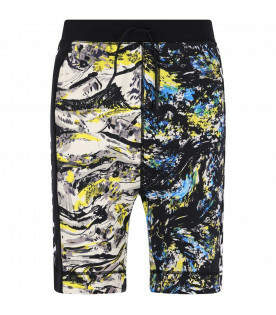 It is embellished with colorful all-over tiger, palm trees and logos. - Details: 100% Cotton. Machine wash at 30°C. 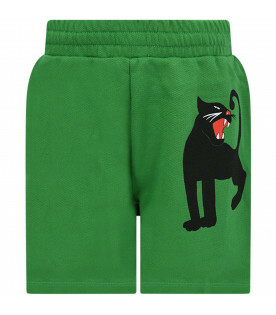 Color: Green -Description: Green short with red elasticized waistband; made from cotton. 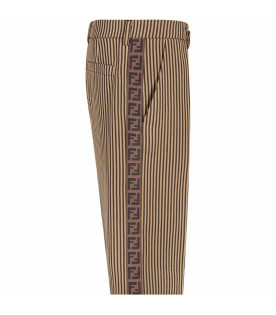 It is embellished with ivory side stripes with blue and red logo. -Details: 100% Cotton. Hand wash.
Color: Brown -Description: Brown short with belt loops, side pockets, closure with clip and zip, and adjustable waistband thanks to inside elastics with button. 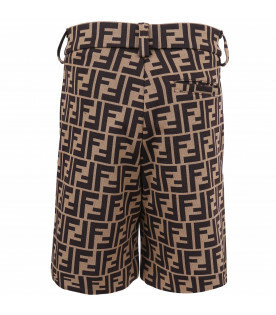 It is embellished with iconic double FF. - Details: 60% Cotton 40% Polyester. Machine wash at 30°C. 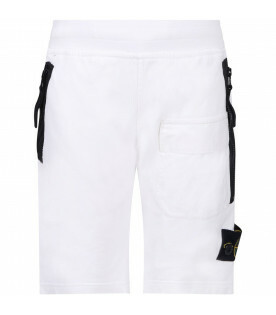 Color: Green -Description: Green camouflage shorts, made from cotton, with closure with button and zip, belt loops, side inseam pockets, big pockets on the legs and back pockets with button closer. It is embellished with beige patch with red logo, applied on the back. - Details: 98% Cotton 2% Elastan. Machine wash at 30°C. 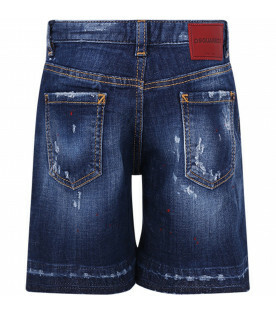 Color: Blue -Description: Blue denim five pocked short with belt loops and closure with buttons, on the front. 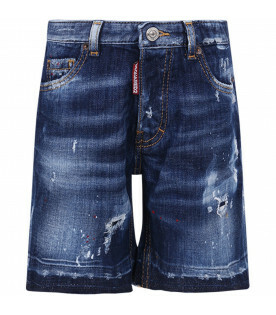 It is embellished with fake rips and red spots. -Details: 98% Cotton 2% Elastan. Machine wash at 30°C. 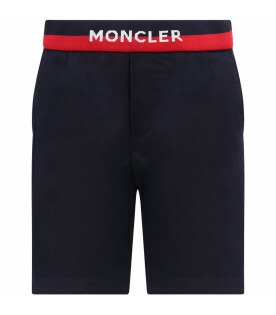 Color: Blue - Description: Blu shorts, made from cotton, with inseam side pockets; blue and red elastic waistband, with logo in a contrasting white; iconic logo appliqued on the back. 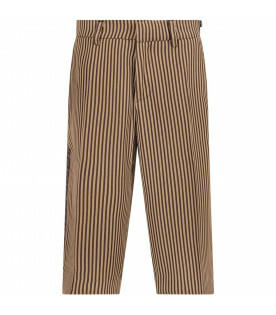 - Details: 98% Cotton 2% Elastan. Machine wash at 30°C. 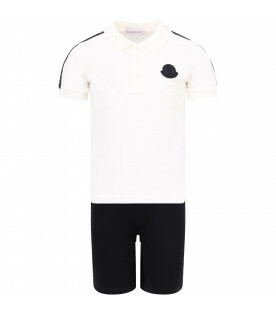 Color: White and black - Description: Suit, made from piquet cotton, composed with white short sleeves, embellished with side stripes, with logo in a contrasting white, with classic collar, closure with buttons, side rips and black rubbered logo, qppliqued on the breast, and black shorts, with elastic waistband, side inseam pockets and black side stripes, with logo in a contrasting white. - Details: 100% Cotton. Machine wash at 30°C. Color: Black -Description: Black short with black elasticized waistband, four pockets on the front and on the back and closure with button and zip, on the front. 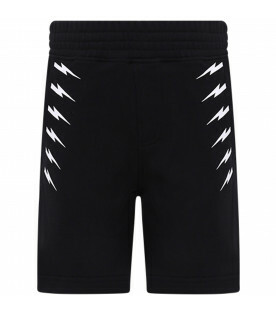 It is embellished with black patch shaped like thunder, on the back and whte logo on the elastic. 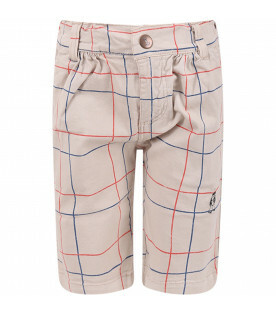 -Details: 97% Cotton 3% Elastan. Machine wash at 30°C. 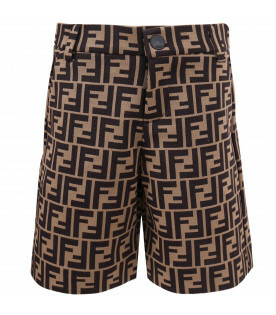 Color: Beige -Description: Beige short with black elasticized waistband, four pockets on the front and on the back and closure with button and zip, on the front. 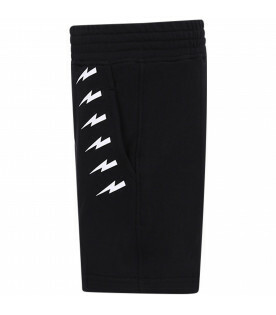 It is embellished with black patch shaped like thunder, on the back and whte logo on the elastic. 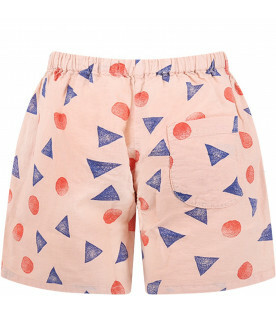 -Details: 97% Cotton 3% Elastan. Machine wash at 30°C. 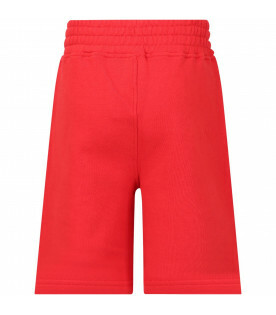 Color: Red -Description: Red short with four pockets, belt loops, adjustable waistband thanks to inside elastic with buttons and closure with button and zip, on the front. It is embellished with black logo, on the front. - Details: 100% Cotton. Machine wash at 30°C. 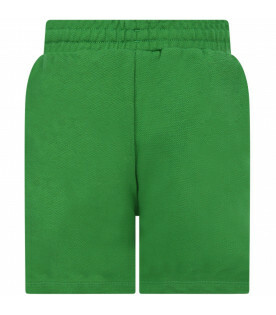 Color: Green -Description: Green short with four pockets, belt loops, adjustable waistband thanks to inside elastic with buttons and closure with button and zip, on the front. It is embellished with black logo, on the front. - Details: 100% Cotton. Machine wash at 30°C. 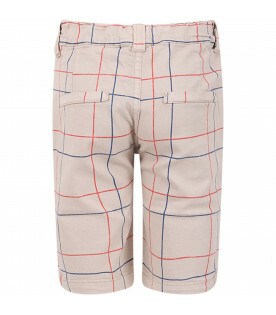 Color: Beige - Description: Beige checked shorts, made from cotton; side pockets, clsoure with clip button and zip, and adjustable waistband thanks to elastics with buttons. This garnment belongs to "To Make a Garden" collection, a call for saving honeybees by plating gardend everywhere, everytime. 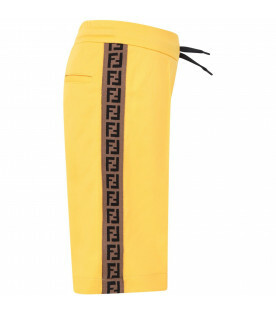 - Details: 98% Cotton 2% Elastan. Machine wash at 30°C. 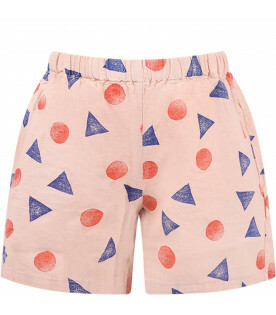 Color: Pink - Description: Pink shorts with elastic waistband, side pockets and back pocket; they are embellished with vintage effect all-over print. This garnment belongs to "To Make a Garden" collection, a call for saving honeybees by plating gardend everywhere, everytime. - Details: 78% Cotton 22% Linen. Machine wash at 30°C. 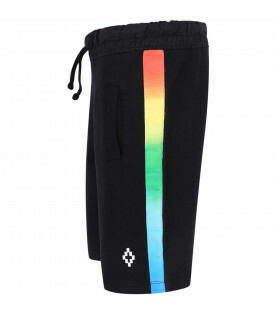 Color: Black -Description: Black short, with frontal crease, side inseam pockets and belt loops; closure with button and zip, on the front and slot pockets on the back. It is embellished with black pathc shaped like arrow, on the back. -Details: 95% Wool 5% Elastan. Dry clean only. 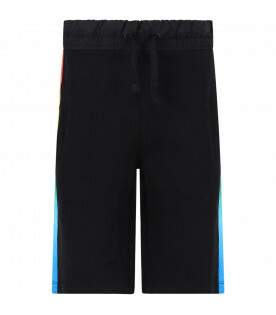 Color: Black -Description: Black short with elasticized waistband, side pocktes and light blue coulisse, on the front. 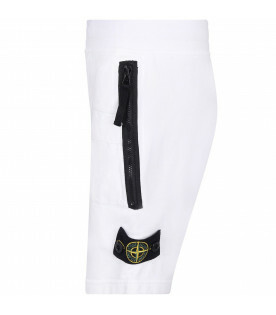 It is embellished with white and blacck rubbred logo, on the front and black rubbred patcch with logo, on the back. -Details: 100% Cotton. Machine wash at 30°C. 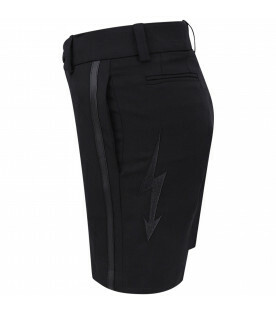 Color: Black -Description: Black short with elasticized waistband, coulisse and side pockets. It is embellished with colorful side barcode and white rubbred iconic logo, on the front. - Details: 80% Cotton 20% Polyester. Machine wash at 30°C. 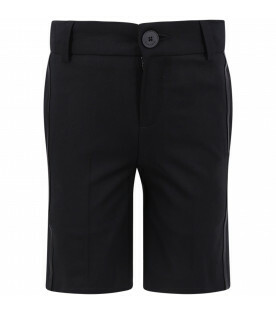 Color: Black -Description: Black cotton short, with elasticized waistband, coulisse and back pocket. It is embellished with colorful print and white rubbred logo, on the side. -Details: 100% Cotton. Machine wash at 30°C.